Alyssa thought, after a few months as a vampire, that she had learned all she needed to about the supernatural world. 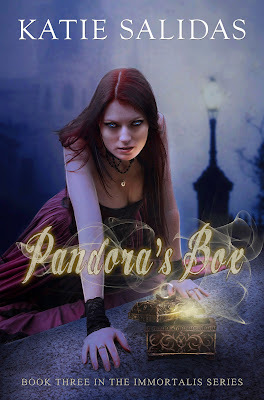 But all that will change when a mysterious package shows up on her doorstep - a Pandora's box. Once opened, it releases an ancient evil, with an insatiable lust for vampire blood. Within moments of its release it the feeding frenzy begins. The only way to stop it, is to try and get it back into the box. Since moving in, Fallon had taken over the empty room in our house, turning it into her own ultra-modern studio apartment: half bedroom, half office space. She’d even begun hanging pictures—something Lysander, had never done the entire time he’d lived here. On one wall she’d hung a large abstract painting in muted tones of blue and green. She was well on her way to making the room feel homey and completely separate from the rest of the house. Fallon was a rarity, a human possessing knowledge of our kind, who hadn’t been turned or killed. She was never supposed to know I was a vampire, but after a hasty retreat I’d made while dodging a hunter from the Acta Sanctorum, I accidentally let the cat out of the bag. My clan, the Peregrinus, weren’t too keen on the idea at first, but after Fallon had showed them she was capable of keeping our secret as well as being helpful, they gave in and allowed her to stay. For the last few weeks, Fallon had taken it upon herself to bring my two-thousand year old boyfriend into the modern era. I nodded. She was right. But it did make me wonder, if I managed to live that long, would I be so out of touch? I hoped not. The sweet smell of fear suddenly permeated the air. Human noses can’t detect the subtle scent, but I wasn’t human and the sugary fragrance teased my senses. Friend or not, I’m still a vampire, and instincts are hard to ignore. Hunting means blood. Fresh, human blood. Fallon knew this, but she had no reason to fear. As far as the Peregrinus were concerned, criminals were the prey—those deserving of our deadly kisses. No vampire in this house would ever harm her, especially since she’d been made an unofficial member (being human and all) after helping us with the Acta Sanctorum’s last attempt to destroy us. “At least he’ll be in a good mood when he gets back,” she said, trying to sound as if it didn’t bother her. I could tell she was lying—beyond the smell of fear, I sensed her worry—but nodded as if I accepted her words at face value. It was understandable and expected of her to be squeamish on the whole blood thing. You can’t truly appreciate the need for blood unless that’s the only thing you can consume. For what it was worth though, she was handling it well. I walked over for a closer look. Oddly, there was no address or any kind of shipping information on the box. I picked it up and looked at the bottom, hoping to find a label there. What I found instead, was weird symbol: a large circle with what looked like a horizontal capital “I” dividing it, drawn in something maroon-colored. I hoped that was just a new Sharpie color, but after a quick whiff my nose said otherwise. Blood. Old blood. We lived in the middle of a quiet suburban neighborhood, hiding in plain sight from the humans surrounding us. Thankfully, in a city like Las Vegas with a thriving nightlife, no one ever questioned our nocturnal habits. Maintaining secrecy was rule number one in our clan, and we did our best to remain inconspicuous. That meant whoever stopped by to drop this off must have known who and potentially what we were. I hadn’t been a vampire long enough to know all the ins and outs of our culture. Maybe this was a way new vampires announced their presence in our territory. Maybe our recent defeat of Quentin and the local branch of the Acta Sanctorum operation had earned us some respect. Maybe it was a parting gift from Santino, our old nemesis turned ally. What’s the old saying, ‘curiosity killed the cat’? But, does it kill the vampire, I wondered. Curiosity got the best of me, I had to see what it was. I used my fingernail to open the tape across the top. A puff of dry air greeted me as I pulled back the flaps. Instead of packing peanuts, the box had been filled with some straw-like material, like the grass in children’s Easter baskets. “Come check this out,” I called out to Fallon while pushing aside the packing material. She tore herself away from the computer and joined me, but the moment was anticlimactic. For all the mystery and ominous symbol on the outside, the contents were a bit boring. An ornately carved wooden box sat in the middle of the packing material; tied tight with a red silk ribbon. It was pretty, but not all that exciting. I reached in, took hold of the box with one hand, and lifted it out. It felt strangely weightless to hold, as if the wood were hollow or perhaps not wood at all, but some kind of Styrofoam. I gave it a squeeze, gently though; I didn’t want to accidentally crush it with my superhuman strength. It had no give. It was solid as a rock. I squeezed it a bit harder, expecting the wood to crack or groan under the pressure, but it too had no effect. “Hmm, good point.” I reached for the box but she pulled it just out of my reach. Her sudden movement shocked me. “Maybe we should wait for the others to get here to open it? This was probably for Lysander,” I said. “An antique for display or something. I doubt he’d appreciate us opening it.” I could imagine it looking nice on his bookshelves. He was, after all, a historian and collected lots of old things. Fallon started to untie the silk wrapper as if she hadn’t heard me. As I thought, the carved words (at least, I thought they were words) were haphazardly etched into the wood all over the box. There appeared no rhyme or reason to their patterns. I had a feeling if I could read the writing, it would all make sense, but even not knowing exactly what it said, I could still appreciate the intricacy. “Hey, are you listening to me? Fallon?” I snapped my fingers in front of her face to get her attention but she was so focused on the box, she wouldn’t look up. A cloud of dust poofed out, spewing dry chalky ash into my face. Fallon let out a violent sneeze that knocked her backwards into the wall. Her newly-hung painting fell with a crash. She dropped the box, spilling its contents, a gray pile of ash, all over the splintered canvas. I felt a strange prickling sensation across my skin. The hairs on my neck stood on end as if electrically charged. The air around me felt as if it were growing colder, like someone had set the thermostat to zero. A shiver danced its way up my spine causing gooseflesh to erupt and spread down my arm. Human or not, Fallon didn’t take Nicholas’ crap. Once she learned he wasn’t going to kill her, it became almost a game between those two: an ongoing battle to see who could annoy whom the most. It was fun to watch the two of them go at it, though somewhere in the back of my mind, I wondered if it might one day go too far. That startled me more than the odd chill in the air. Nicholas was always quick with an answer or some kind of quip. For him to be silent meant that this, whatever it was, was not the innocuous present I had hoped it would be and further confirmed my feelings of unease. “Just this box.” Fallon dropped the cardboard box and handed the wooden box to Nicholas. “Death personified.” Nicholas’s voice warbled, hinting his own worry. A cold breeze blew through the den making the curtains covering the large, arched window dance. I looked up to see if the fan had been turned on, but it remained still. I nodded, remembering Lysander’s telling of our legend. Vampires were the offspring of the Keres, who were daughters of Nyx, Goddess of the night. The Keres were extremely bloodthirsty creatures who swarmed battle fields to drink the blood of fallen soldiers. They finished off the dying so their souls could pass on to the underworld. According to Lysander’s story, one of the Keres had mated with a dying man and the first vampire had been born of that union. Immortal, like its mother, the new creation carried an insatiable bloodlust but took on the form and build of its human father. Nyx didn’t wish the new creation destroyed and tried to hide it from the world. She cursed it to only be able to roam the night, where she could watch over it. The lights in the room flickered for a moment. Again, Fallon and I exchanged worried looks. Nicholas’ eyes narrowed. He glanced from me, to Fallon, then to the box in his hands. Fallon’s computer beeped. The twangy, mechanical sound startled me from my thoughts. When I looked over, it was in the process of rebooting. The operating system splash screen flashed on the monitor.